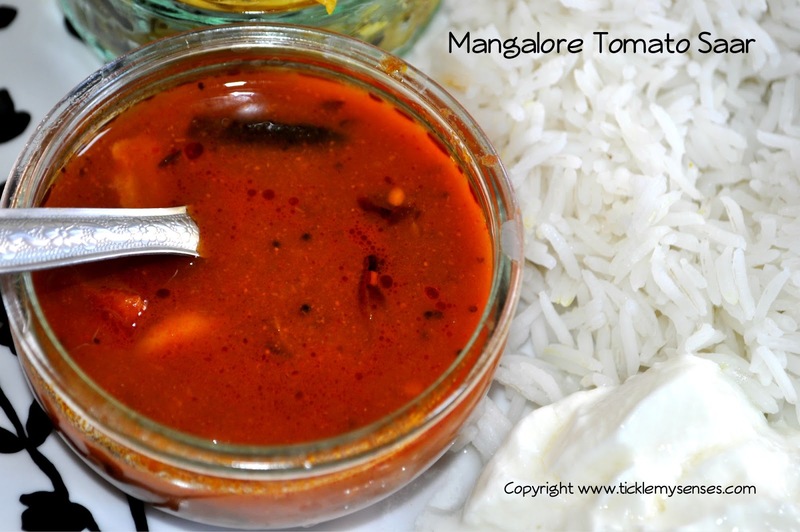 Tickle My Senses: Simple Mangalore Tomato Saar or Tomato Soup without lentils. Who can resist a steaming hot bowl of tomato saar to either drown your rice in or to sip as an appetiser before or after a meal? Well not me, or any Mangi that I have come cross. 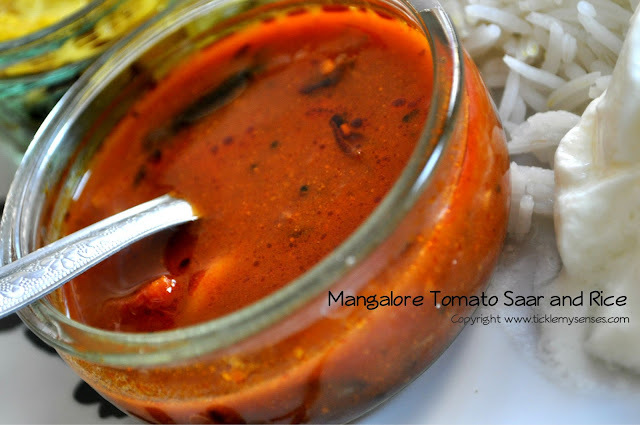 This tomato saar recipe is for the LAZY....sorry beg your pardon!! did I just say that...ahem.. YES I DID!! 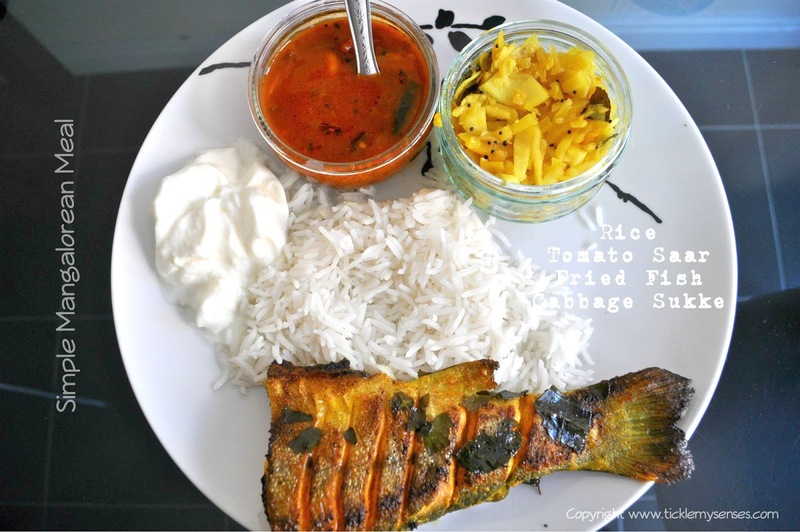 because many a times I fall under that bracket, or should I be cheeky and say this recipe is for the canny, who are conscious of their time and would rather use a few shortcuts to produce a suprisingly delicious tomato saar, with absolutely no compromise on flavour, restaurant quality!! One that will give your spouse the impression that you have been sweating over boiling tomatoes, peeling their skins and pureeing them, then pounding spices, etc etc... to produce this delicious concotion!! When you have done none of that....hahaha. Enjoy this delicious tangy and piping hot tomato saar either plain as is, or spice it up with your favourite rasam powder. Pour the piping hot tomato saar over your rice (for me the rice has to be swimming in the saar) then using your finger tips coat the rice with the piping hot saar, making sure you do not burn yourself ! then scoop mouthfuls of this delicious mixture into your mouth, accompanied with fried fish and vegetable. When all is done, lift up the plate to your lips and drink off any remaining saar, the orphaned bits can be polished off by licking your fingers....slurpp!!! Once you are done, put your feet up and revel in the feeling of completeness, or if you cannot resist, dive in for some more :). Repeat and enjoy!! Serves:4 | Preparation time: 3 minutes | Cooking time: 20-25 minutes. 1. Heat 2 tbsp of oil in a heavy bottom pan. Add mustard seeds and when they crackle, add broken red chillies, curry leaves and hing and saute for a while. Add crushed garlic and stir for another minute. 2. Add the chopped tomatoes and salt and stir, allow the tomatoes to cook on a medium to high flame till they are softened and the juices dry out, should take 7-8 minutes. 3. Add the turmeric powder and rasam powder to the softened tomatoes and fry for a minute on a medium heat. 4. Then add the tamarind extract and mix well. Add the hot water. Mix well. 5. Close the vessel and cook the saar on a low flame for about 7 - 10 mins. Taste for salt. Adjust. Sprinkle over chopped coriander leaves. Serve hot. My keralite neighbours often sent rasam to us especially when I was sick and all the meds left a bitter taste in my mouth. Loved it. The fish on the plate looks equally tempting. its sucha a relief to mangi pple who stays abroad wher we cry for home food , i love my mums tomamto saar n its perfect combi with fish fry. thank you for sharing the receipe. thank you for sharing this simple yet tasty receipe , the best combination with fish fry.. mouths watering ;p . i miss my mums tomato saar. Thank you sooooo much for this wonderful recipe.......I am a Konkani married to a mangalore an. This helped me a lot n my hubby n father in law were too happy that I made a saar the same way my mother in law used to make it. My hubby has specially thanked you for posting this as he can now taste the same saar his mom used to make for him. Though I am a vegetarian, I went through your recipes and recommended to my NV loving friends. A sooper blog, indeed. Thanks. Hi, Just wanted to know from you as to which brand of rasam powder would you suggest. I have tried most of them but in vain. Many thanks Sweeny Dsouza for visiting the blog and for your kind appreciation. I hope this tomato saar can satisfy your yearning for your moms saar. I agree with you there is nothing better than Mom's cooking!! Thankyou Payal Salgaonkar. Im so happy you liked this recipe and managed to please your family. A big welcome to your hubby. I hope you can find many more recipes that will please their tastebuds. Happy Cooking! !